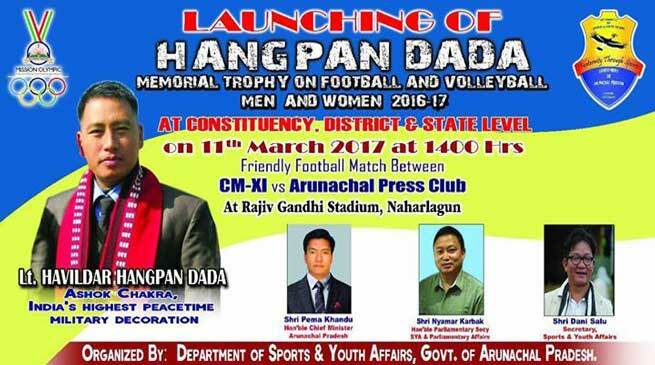 In memory of valiant son of India, Hangpan Dada Memorial Trophy was launched on Saturday with a friendly football match held between CM XI and Arunachal Press Club XI. The tournament, which was earlier known as Chief Minister Football and volleyball Trophy was renamed after recipient of Ashok Chakra, late Havildar Hangpan Dada. The competition will be held at district, constituency and block level. Today’s match was won by APC XI. Havildar Dada, who died in Kupwara on May 27 after killing three terrorists, was awarded Ashok Chakra on the eve of Independence Day this year by President Pranab Mukherjee. Hav. Dada, 36, hailed from Boduria village in Arunachal Pradesh and was posted in the high mountain in north Kashmir since late last year. “Late Hangpan Dada made the supreme sacrifice fighting for his country. He needs to be immortalized,”.